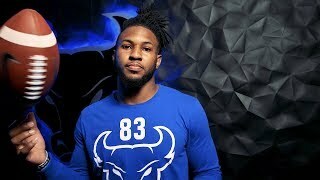 The people who know him best share everything you need to know about Buffalo Bulls wide receiver Anthony Johnson. Anthony Johnson was big on basketball. He started at a young age. He was one of the top high school players in South Carolina. He was poised to go pro. The problem was, South Pointe High School in Rock Hill, just across the state line from Charlotte, N.C., wasn’t known for producing NBA-caliber talent. It was better known for the steady stream of football players it sent to the NFL, including two of Johnson’s cousins: Jadeveon Clowney, the first overall pick in 2014, and Jonathan Joseph. A third cousin, former Buffalo Bills safety Jonathan Meeks, now a free agent, also attended South Pointe. Johnson excelled in both sports. So when it came time to decide which to play in college, his father made the decision for him. He felt Johnson had better odds of making it big on the gridiron. Johnson wasn’t thrilled. “I’m cool with it now, though,” he says with a laugh. That’s because the senior wide receiver is a likely high-round pick in the 2019 NFL Draft. His stock soared after a stellar junior season with the Bulls, during which he racked up 76 catches for 1,356 yards and a school-record 14 touchdowns. He also led the country with six games of 140 or more receiving yards. While expectations for the Bulls are sky-high this year, there’s a little extra motivation for Johnson and his teammates. UB finished 6-6 last year, but four of those losses were by 4 or fewer points. Had any of those Ls turned to Ws, UB would have been a shoo-in for a bowl game. Instead, they got snubbed. Johnson’s path to Buffalo hasn’t been easy. A car accident early in his junior year of high school flung him out the back window of a friend's car, leaving him with a concussion. And his grades kept him from receiving any Division I scholarship offers. So he went the junior college route, playing one season each at Butler (Kansas) and Iowa Western community colleges. His season at Iowa Western caught the attention of UB receivers coach Rob Ianello. With his grades also improved, Johnson received a scholarship offer. But he didn’t know anything about UB. He consulted Stephon Gilmore, another South Pointe graduate, who played with the Bills from 2012 to 2016. Gilmore gave UB props, but warned Johnson that Buffalo is “a different type of cold” than what he had experienced in Kansas and Iowa. After redshirting his first season at UB due to an injury, Johnson made his Bulls debut last fall. There was speculation following his breakout 2017 season that he would leave UB early and enter the NFL Draft. But Johnson had other plans. In December, he will become the first member of his immediate family to receive a college diploma. Four months later, Johnson may be called onto an even bigger stage, with millions of NFL fans watching to see where he ends up.